Poverty, oppression, and the longing for deliverance marked Emma Goldman's early years. Born into a poor Jewish family in a backward, anti-Semitic country, Goldman struggled to escape, first through flights of imagination, then through formal education, and finally by means of emigration. On June 27, 1869, Emma Goldman's life began in Kovno, a small imperial Russian city, now in Lithuania. Her family suffered from the anti-Semitism of the times, living in Jewish ghettos and moving often in search of opportunity. Brutalized by this life, Goldman's father directed his anger against his family. His often violent assertion of authority over them led young Emma, perhaps more acutely aware than he of the injustice of their situation, to imagine instead directing violence outward against the enemies of the Jewish people, in the manner of Judith, the Biblical heroine with whom she identified. Goldman became interested in more modern ideas at twelve, after the family moved to St. Petersburg. There she glimpsed the possibility of ending the old order when Czar Alexander II was assassinated. Excited by the ideas of the Russian Populists and Nihilists, Emma eagerly devoured Chernishevsky's What Is to Be Done? and promptly replaced her childhood heroine Judith with Chernishevsky's modern Vera, a political organizer and cooperative worker. Soon after, Goldman left Russia to seek what she hoped would be a modern education in a German Gymnasium. But Emma rejected the rote learning and authoritarian teaching methods she encountered in her school, and she fought with her German relatives. Nevertheless, Goldman developed an enduring appreciation of literature, opera, and classical music, which helped alleviate the pain she met in life. Returning to Russia, Goldman soon found herself thinking of America. Her father put her to work in a corset factory and began pressuring her into an arranged marriage. Rejecting his demands, the sixteen-year-old Emma set sail in 1885 for America in the company of her older half-sister, Helena. 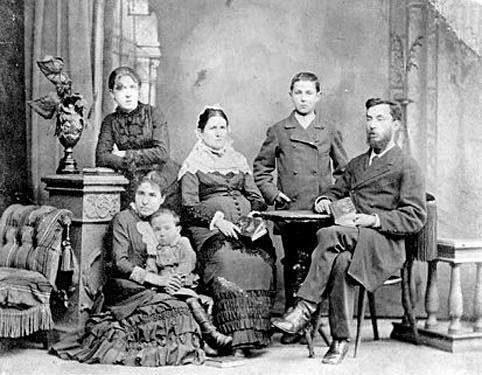 The Goldman family, St. Petersburg, 1882. Left to right: Emma, standing; Helena, seated, with Morris on her lap; Taube; Herman; Abraham. Portrait of the anarchist as a young woman, c. 1890.